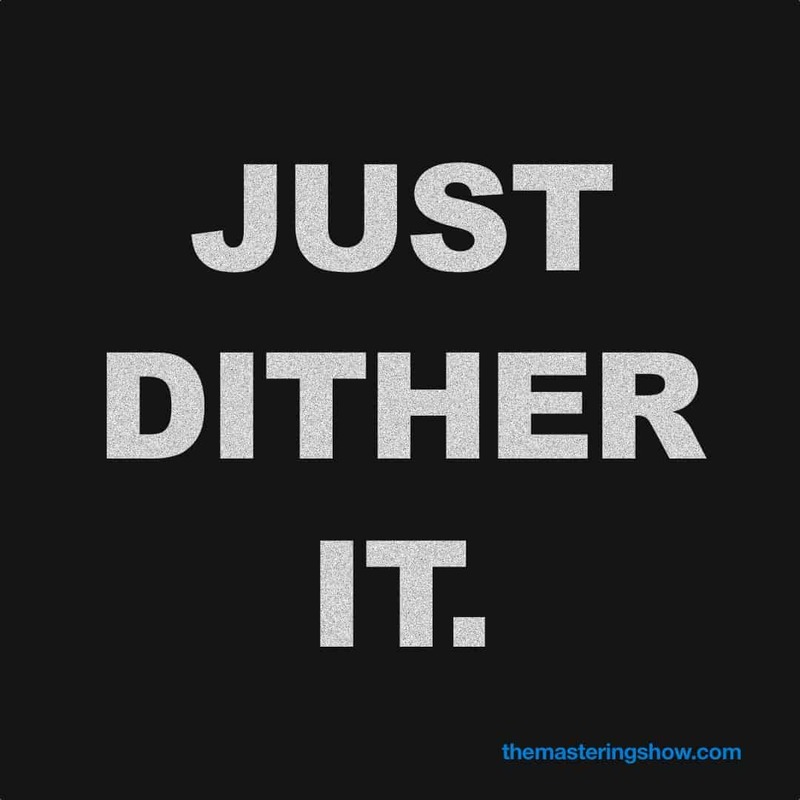 Yes – it’s The Dither Episode ! But hang in there, it’s not as bad as you might think. My guest host this week is Jon Tidey from reaperblog.net, who hates talking about dither, so I had to work hard to keep it interesting. And I think I succeeded, mostly! We cover loads of topics, like why the analogy of hi-res digital audio with digital photos is wrong (or at least deeply misleading) and why dither means digital ‘resolution’ is NOT a real thing. 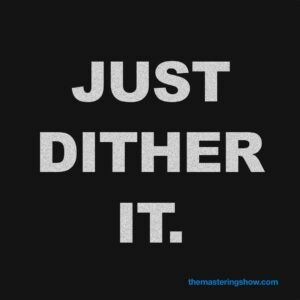 Why you should stop worrying and just dither ! Go ahead, share this as much as you like. Why would you need to export the originally recorded 24 bit files using dither when it’s just a normal export of audio? I understand it as far as doing that when changing the bit depth but otherwise rather unnecessary I would think? Years ago, trying to escape from Dither 😉 , I invented this procedure: bouncing my 24/48 sessions, without dither, to 24/48, then importing them in a 16/44.1 session and it seemed to me that the result was better (than bouncing with Dither), but thinking about it later, I suspected ProTools added dither on import without mentioning it, am I right? I don’t know if you bother checking youtube comments, so I’ll paste here what I said there. Ian, I don’t think you fully understand dithering yet. The dithering noise that you can hear by itself is only as loud as the least significant bit, yes, but that doesn’t mean that the only place it affects things is at that low of a volume. Each and every sample at each and every possible volume level is affected by dither. When they say dither only affects the least significant bit what that means is every single sample is affected, but only by the amount of that least significant bit. So in an 8-bit signal where you only have 256 possibilities, if you apply 1-bit of dither then you are potentially affecting every sample by a value of 1. You are not only affecting samples that are 0 or 1. You are affecting the entire range of 0-255 by 1. A sample that has the value of 173 when not dithered could stay at 173 when dithered or could change to 172 when dithered. This is likely why you thought you could hear a difference in the loud Hammond organ recording. Dither affects every sample at all volumes. In an 8-bit signal that means dither is capable of changing things by 1/256. In a 16-bit signal it is capable of changing things by 1/65,536. In a fixed-point 24-bit signal it is capable of changing things by 1/16,777,216. Floating point complicates it a little. But the point is, dither can change each value in the entire minimum to maximum range by one step, and it doesn’t only affect from zero to one step above zero.